Cobber volleyball against Valley City State, Oct. 16, 2017. COBBER SID. With fall in the air and the leaves starting to fall, the Cobber women’s volleyball season is officially underway. Led by head coach Tim Mosser, the young team looks to grow in conference play and find themselves in the playoffs come November. After suffering its worst losing season of the past two decades last year, the team is rallying together to try to find success. Mosser’s goals for the season define success as team improvement, ultimately leading to playoff opportunities if achieved. With a roster including just one senior and one junior, the seven sophomores and 14 freshmen will have big roles to fill early on. Sophomores Jill Klaphake and Casey Coste have stepped up as young role players early on, with Klaphake leading the team in assists and Coste taking the lead in digs. Mosser sees talent in his young players as they adjust to their roles and playing time. He says keeping a positive attitude and a focus on their success and potential is key. Senior Haley Cuppett is intent on using team bonding to improve the team’s success throughout the season. While Mosser improves the young role players, he has veterans Cuppett and junior Brianna Carney to lead the team with experience and understanding of team culture and goals. As leaders both on and off the court, Cuppett and Carney bring high energy as they lead the team in kills this season. As a junior with heavy experience, Carney looks to motivate this team towards fulfilling its potential as the season unfolds. The Cobbers are 1-2 in MIAC play after facing off against St. Thomas, Macalester, and Augsburg. Notably, the faceoff against the Tommies showed Mosser the tenacity of this young team. 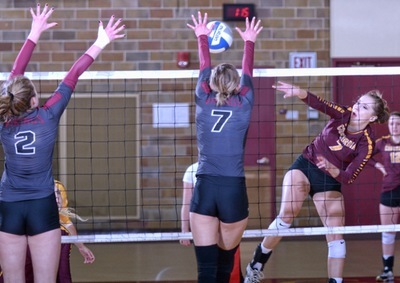 While the match finished as a 3-0 sweep in favor of the Tommies, the youthful Cobbers showed grit. “The St. Thomas video commentators said on the air that they thought our match with them would be a blowout, but the young Cobber team was giving the Tommies all that they could handle – and we were! We are excited about the improvement we have already seen and look forward to continuing to raise our level of play,” Mosser said. With the regular season underway, the Cobbers must now dive head first into a tough conference slate in order to satisfy their goal of a playoff finish. The Cobbers will take on Carleton tomorrow night inside Memorial Auditorium before a meeting with St. Mary’s at home on Saturday afternoon to wrap up the month of September.